i really like the skin ideas with the album covers and all. i didn't read all te suggestions here but i think it would be cool to move furthur with these and work on Farmhouse-Undermind because those are just cool covers. and there are some great covers in the LivePhish series too. no rush or demands, i was just makin' suggestions. It won't be long matey! Last edited by Anonymous on Wed Feb 01, 2006 1:33 am, edited 1 time in total. Round Room should be teh_sweet. What about a A Live One skin? Or a Hampton Comes Alive Skin? Or a NYE 95 one? Or .....ok I'm getting carried away. Hampton would be cool though. this story one is great! nice clete! Where are the new skins?! I don't think we should pressure clete anymore. He set up that wonderful individual song discussion. Wow Greg, I'm not attached to the OKP 24/7! I'm sure even the G-Man himself respects all the time you've put into this great site. ^i should have known better than to actually look for it huh? Geez, I am took also... Damnit..
No excuses! I demand more skins or I will cease to post....forever! I sort of believe you! Sorry, I have had a lot of work on and I'm actually off to Leeds for a month at the end of this week so I may not be around for a while! so it aint so, Ian...SAY IT AINT SO!!! Only for a month! I will have internet access but will be spending the majority of the time in the land of Sixela. There there.... We will comfort you with Eggs and beans while IAN is making sweet music with his NEW BASS.... dig it IAN and have a grand time !!!! 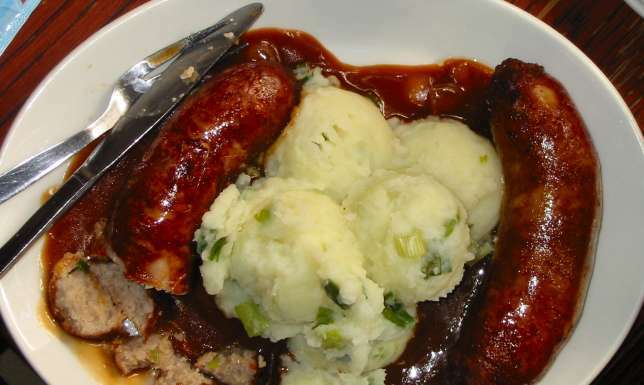 I had bangers and mash the other night. ^ that makes me Jelous, its so hard to find the real deal on this side of the pond..
buh... the memory of british food gives me dry heaves.